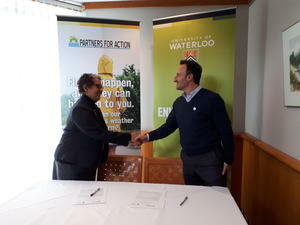 The Faculty of Environment at the University of Waterloo, Partners for Action (P4A) and the Canadian Red Cross (CRC) are proud to announce a new partnership to advance flood resiliency in Canada. P4A is working with the Red Cross on sponsored research in the area of flood risk perception, as well as personal and community preparedness to flooding. Researchers are surveying those impacted by flooding in Windsor, Ontario, and conducting focus groups with community members and emergency service providers to understand how people perceive and act on flood risk. This information will drive communication initiatives by P4A, the Red Cross, and the City of Windsor to make our communities more resilient to flooding. Along with Red Cross, P4A is also partnering with Public Safety Canada, the Insurance Bureau of Canada, and others on our FloodSmart Canada initiative, a national flood risk communication strategy. Waterloo’s collaboration with the Red Cross contributes to researching flood risk, public awareness strategies and co-developing approaches to public awareness, education and citizen engagement through the FloodSmart Canada partnership. University of Waterloo has a strong research program and a commitment to advancing flood resiliency in Canada in the face of a changing climate and extreme weather. A big part of this effort is P4A. Founded with funding from the Co-operators Group Ltd. and Farm Mutual Re, P4A is housed in the Faculty of Environment. 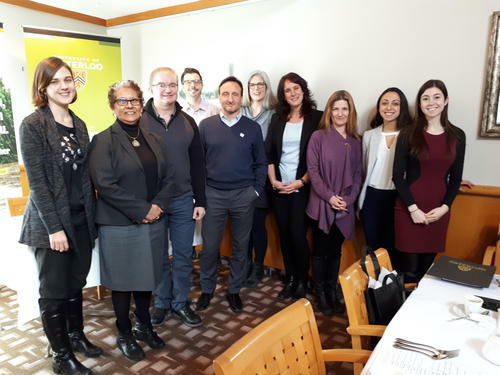 As an applied research network collaborating with a diverse set of stakeholders from academia, business, government, and non-governmental organizations P4A works to protect Canadians from the risks of flooding.